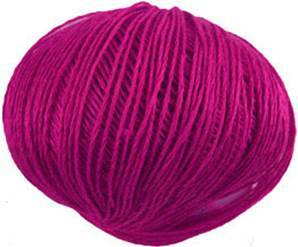 Katia Lino 12 in cerise is made from 100% pure linen is a 4 ply knitting yarn that is perfect for lace knitting on larger needles to make the most of the natural drape of linen. Lino feels stiff on the ball but softens beautifully with washing. Machine washable at 30' with a suggested tension of 17st/ 23 rows to 10cm on 5mm needles and a generous yardage of 150m / 164yds per 50g ball. Click on the photo to download a free pattern.